So Thanksgiving is approaching, and many of us are headed to meet up with our friends and loved ones for the celebration. These flies seemed to think it was the time for a gathering as well, although I doubt its to eat turkey. I actually have no explanation as to why these flies have all picked this leaf to gather on, I suspect it is some sort of mating thing. 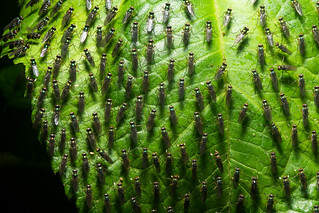 nearby leaves of the same species and even the same plant did not have a gathering a flies on them, so that makes me think its more of a social thing influenced by the other flies rather than a feeding event. All the flies are of the same species and note that they are all facing in the same way as well, an odd encounter indeed.